This clever cherry and walnut design lets you drop off everything in your pockets, then turn on the tunes. Drop off everything in your pockets, then turn on the tunes. Handcrafted and oh-so handy, Matt Thomas' clever cherry and walnut piece is designed to be a natural amplifying speaker for your phone, creating a chamber that boosts sound and makes it more focused. 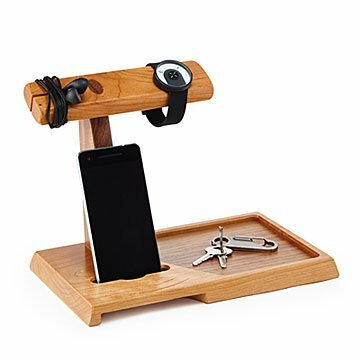 It's also a catchall valet for keys, change, rogue guitar picks, you name it, and a hang spot for headphones and watches. Keep this handsome guy on display wherever you like to unload, and unwind. Handmade in West Virginia. Raised by a dad who was a union carpenter, Matt Thomas knew he wanted to make a living working with wood and metal by the time he was 16. His workshop is situated in the Appalachian Mountains of West Virginia, surrounded by both inspiration and sustainably harvested lumber. Much of the wood he uses is reclaimed, and he goes to great lengths to ensure no raw materials go to waste, right down to the sawdust: it keeps the chickens happy. My husband loves everything about this cell phone amplifier! he has it at work sitting on his desk he gets so many compliments. The only thing is the cut out for the cell phone is a little too thin width-wise, as he has an OtterBox cover on his cell phone, but he can still lean it up against the wood pole and it still works great! Provides an elegant, useful drop spot for my husband's wallet and keys as well as holding his cell phone and watches. He can even store his earbuds in the notch to the left. It is built to last with solid, hardwood construction and a well-applied finish. Perfect gift for my three brother in laws. A clever organizer . Never tested the cell phone amplification. Perfect for organizing watch, wallet, ring and phone. The amplifying feature for the phone is exceptional. My husband loves it! The craftsmanship is excellent; it's such a useful and lovely item. There are many phone valets on other sites, but none were a combination amplifier and phone holder. Love that it is handcrafted and made of wood. 10/10 would recommend to a friend or give to another family member. A great way to keep my everyday essentials together in one place. The phone speaker works great too.